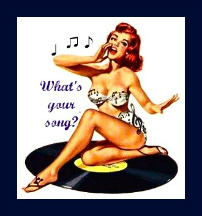 The Fragile X Files: What's Your Song? I love these blog hop things. They get me to thinking. When I saw this "What's Your Song?" link up on the blog Things I Can't Say, a blog I really like (although the link up for the "What's Your Song?" is actually at Goodnight Moon, another very cute one) I knew immediately what my song is. Shortly after the boys were diagnosed with Fragile X Syndrome, I was at work and listening to Yahoo Music while toiling away in my little cubicle, and Smile by Nat King Cole began to play. Instantly I began to cry. Of course, at that time, absolutely everything from Folger's commercials to scraped knees to cloudy days made me bawl like a baby. It was a tough time. Mark and I worked pretty hard just getting through a normal day, without even allowing ourselves to think about what was going on with our children. I was shaken to the core, and it was all I could do to keep up a semblance of normalcy on the outside. This song will always make me think of my boys and that time when I needed to hear that if I smiled, things would be okay. I even used it in a little slideshow I made for You Tube a couple of years ago. Smile is the last song, so if you start the movie and then go right up to about the 7:00 minutes spot, that's where it starts.